League cancelled at Painesville today, because of wind chill. see you next Sunday! This will be the usual! We will throw 18 holes of Disc Golf in any weather conditions to support St. James Food Programs in Painesville. It is an Official Ice Bowl event and registration will open soon. We are moving to Feb. to give us more time to order Disc as its been a rush in the past. This will be the 10th Lake county Ice Bowl going back to the ones at Osborne! 25 dollars and two or more cans of food is entry and a optional 5 gets you into the side games and a extra ticket for the main prize! Hopefully a basket! Thanks for your past support, and lets fill this again. Over 30 the last 2 years!! Disc Choices are in! You will have your choice between 7 disc this year. We are doing hole sponsors for those who would like to help feed the Hungry even more. Players, Business, Small Shop, individual, 25 dollars will get you a sign on a hole and really goes a long way to help the food program. Even if you do not play you can still help out St. James Food Programs. Online registration closes Dec. 30th. After that all registrations will include a mini instead of a disc as my order must be in by Jan 1st! Remember The Ice Bowl Theme!! "No Wimps, No Whiners" See you there! Just a reminder no League this Sunday Memorial Day Weekend in Painesville!! Enjoy the time with Friends and Family!! See you in June!! We will be hosting a work day St. Paddys day 9-12 noon. We will be cleaning branches off of holes 11, 13 and 9 and a garbage cleanup! We will be hitting a couple of bars after!! If you are not an early party freak, join us!! Painesville Recreation Park!! Bring tree saws, shovels and push brooms!! SAT. Oct. 14th Painesville Recreation Park Course closed! Course will be closed Saturday the 14th for Painesville's Fall Fest! Disc Golf and Hockey will be closed. Please try out Osborne in Willoughby or Sims. The League will be back at Painesville for this weeks scrambles. See you at 10! Well, guess there is a Fish Fest in Painesville this weekend at Recreation Park, so Sunday League will be at Osborne Park in Willoughby this Sunday the 17th! 10 A.M. still 2 rounds of 9! I am moving nit because all the lake holes are probably gonna be un-playable! Tomorrow, I ask that you all consider coming out to Osborne Park in Willoughby to support one of our own! Duane has been fighting the good fight and we would like to give back to his family!! Duane has been instrumental in the upkeep and keeping Oz a great little course to play! I ask that you pre register online or comment your intent to show! We are looking for items for CTP's and are hoping to have one for each hole. Please contact Bill "Ninja" Savage, Ryan Tex Kimbro, or Mickey Anderson 440-655-9996, if you have a disc mini or any items that could be used for CTP's and possible raffle ( do not have to be disc golf related). The only prizes will be first place each division!! Remember this is a full benefit and ALL monies will go to the Koczan Family. Sept. 9th Osborne Park, Willoughby, Ohio. Also looking for pot Luck dishes for the after party at Lakeshore Lounge. Please come and support Duane and his family! Thanks ALL Lets FILL THIS UP!!! As we get closer to the date, I ask that you all consider coming out to Osborne Park in Willoughby to support one of our own! Duane has been fighting the good fight and we would like to give back to his family!! Duane has been instrumental in the upkeep and keeping Oz a great little course to play! I ask that you pre register online or comment your intent to show! We are looking for items for CTP's and are hoping to have one for each hole. Please contact Bill "Ninja" Savage, Ryan Tex Kimbro, or Mickey Anderson 440-655-9996, if you have a disc mini or any items that could be used for CTP's and possible raffle ( do not have to be disc golf related). The only prizes will be first place each division!! Remember this is a full benefit and ALL monies will go to the Koczan Family. Sept. 9th Osborne Park, Willoughby, Ohio. Also looking for pot Luck dishes for the after party at Lakeshore Lounge. Please come and support Duane and his family! Thanks ALL Lets FILL THIS UP!!! We had two groups of Disc Golfers at the final KIDS CAMP class. We threw 3 holes as two groups and had prizes for the first place person in each group and participation cards for all! A couple of the kids have gotten pretty good over the last few weeks. 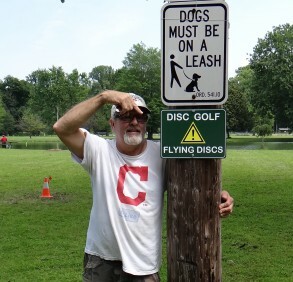 Thanks to the City of Painesville for making Disc Golf a part of this years camp. Thanks Rollie Rush Jr. for the hand today, and exhibition of cool shots! The kids loved the over the lake shot! Because of scheduling conflicts with Painesville the Discraft Ace Race is canceled, after looking at the full schedule, I could not see an acceptable date. If any other club wants at it have a go! I do not want to step on already schedule! Sorry in advanced. Displaying 1-20 of 85 total board posts.